One of my favorite comfort food dishes, a traditional eggplant parmesan recipe, can really rack up the Weight Watchers Points. But my light Eggplant Parmesan has all the delicious and traditional flavors but for just 5 Points per serving! And did I mention that this is made with three kinds of cheese? Oh yeah…and the eggplant is breaded. It is DELICIOUS. The leftovers were quickly devoured for lunch the next day. Everything worked together so perfectly, making the ultimate low calorie Eggplant Parmesan Recipe. Once you make this dish at home for yourself, you’ll get that Italian food craving seriously satisfied, and yet you’ll still stay on track with your Weight Watchers goals. Enjoy! A healthier version of a popular Italian comfort food recipe, my Eggplant Parmesan is to die for. Breaded eggplant cutlets, layered between cheeses and pasta sauce. It’s hard to believe each serving is just 5 Points. Preheat oven to 375 degrees. Spray a large baking sheet with non-fat cooking spray. Place liquid egg substitute in one bowl, and the panko in another, shallow bowl. Bread each eggplant slice by first dipping into the egg substitute, shaking off the excess, and then dipping in the panko. Place eggplant slices onto baking sheet, place in oven and cook for about 30 minutes or until golden brown, flipping over once, halfway through cooking. In a medium sized bowl, combine cottage cheese, Parmigiano-Reggiano cheese, basil, oregano, garlic, crushed red pepper, salt & pepper. To assemble, spray a 13X9 inch baking dish with non-fat cooking spray. Spoon about ½ cup of the pasta sauce on the bottom of the baking dish. 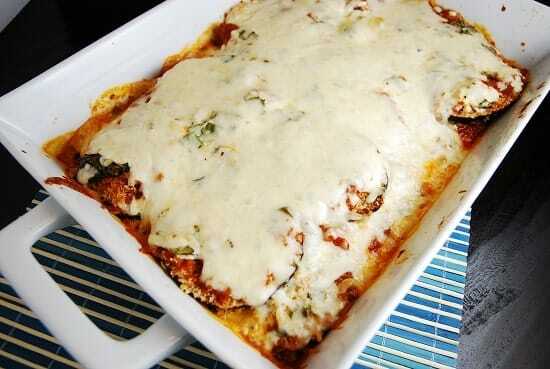 Layer half of the eggplant slices over the pasta sauce and top with ½ the cottage cheese mixture. Top with ½ of the remaining pasta sauce, and the 4 slices of lite provolone. Then repeat layers again, but ending with the pasta sauce. Cover tightly with aluminum foil. Bake at 375° for 35 minutes. Remove foil; top with shredded mozzarella, return to oven and bake for another 10 minutes or until sauce is bubbly and cheese melts; let cool for about 10-15 minutes before serving. Cut evenly into 8 pieces. How well do you think this would freeze? Eggplant can get a bit rubbery when frozen, but sometimes the tomato sauce helps prevent that. I haven’t tried freezing this one yet, so I couldn’t say for sure if it would work or not. Sounds wonderful! When I broke down the ingredients and added the WW on-line points plus values, I got 49 total points plus, or 6 pts. for a 1/8 serving. I used the lowest panko I could find on WW on-line which is 12 pts for 2 cups. Can you break down the ingredients by pts. plus values? Thanks! Made a 1/2 recipe today for just me and served with fennel & grapefruit salad – Delish! Thank you for the recipe. I made this last night and it was pretty good! The eggplant held up really well I used whole wheat breadcrumbs instead of panko. The only ting that could have made it better would have been a little more sauce, the eggplant seemed to soak up a lot of it. I will make this again thank you! Could I substitute low fat/fat free ricotta cheese for the cottage cheese?